This startling Scandi-crime debut launches a new series from a couple who scripted Swedish TV hits including Arne Dahl and Wallander. Spring Tide – also heading to television in 2015 – opens with a grisly beach scene on the Swedish island of Nordkoster, then shifts to Stockholm 24 years later where the homeless are subject to random, violent attacks. A trainee cop, Olivia Rönning, is drawn to the 1980s cold case for a class project, which leads her to Tom Stilton, an ex-police detective with issues. But she fears for her safety as the investigation reveals a web of corruption involving big business, call girls and a Costa Rican connection. 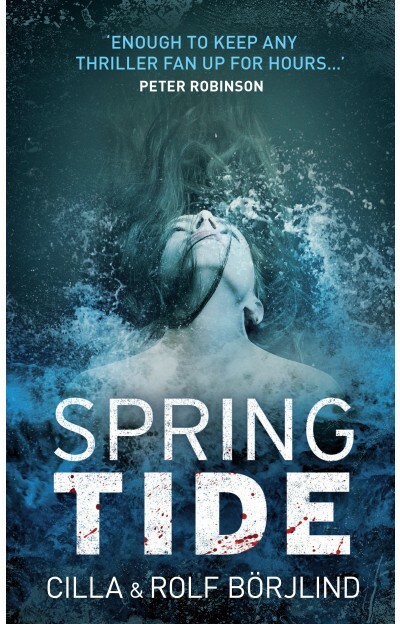 Spring Tide is a novel that artfully combines sharp humour, suspense and social issues – shades of Henning Mankell and Maj Sjöwall & Per Wahlöö – within concise scenes that keep you reading. Buy the book before it hits the small screen. To echo this week’s triumphant Booker speech by Hilary Mantel, you wait years for a Riverside blog on foreign crime fiction and then two turn up at once. But Radio 4’s scrutiny of European literary detectives in the weeks ahead cannot go unmentioned, and the station’s dramatisation of Maj Sjowall and Per Wahloo’s series featuring detective Martin Beck is likely to create huge demand for these exemplary crime novels set in Stockholm. Between 1965 and 1975, the husband and wife writing duo published 10 captivating police procedurals that also held up a mirror to Swedish society and clearly influenced fellow Swede Henning Mankell. The accompanying 15-part series Foreign Bodies is a typically ambitious Radio 4 project. It might have the alarmingly portentous subtitle ‘A History Of Modern Europe Through Literary Detectives’ but we should be in safe hands with presenter Mark Lawson, who regularly recommends continental crime writers on Front Row. The series will show how crime fiction reflects society’s tensions across Europe by focusing on popular detectives (Mankell’s Kurt Wallander, Nesbo’s Harry Hole and Camilleri’s Salvo Montalbano) and venerable literary creations such as Maigret and Poirot, as well as introducing genre-bending crime authors Friedrich Durrenmatt and Nicolas Freeling. The Martin Beck series starts at 2.30pm on 27 October and Foreign Bodies begins on 22 October at 1.45pm (and available on iPlayer Radio). THE Scandinavian invasion has defined crime fiction in recent years as we embraced chilly, bleak and ingeniously gruesome novels from Henning Mankell, Jo Nesbo and Hakan Nesser. Perhaps readers are now ready for a warmer crime climate. Just as Mankell’s Wallander novels benefited from TV adaptations, 87-year-old Andrea Camilleri’s enjoying a sales boost for his Sicilian policiers thanks to the Inspector Montalbano TV series on BBC4. Montalbano is hot-blooded but astute, a dedicated investigator with his own moral code. Italian society’s problems – corruption, the mafia, political instability – add a dose of disturbing reality to Camilleri’s concise yet labyrinthine crime stories. This veteran author’s observations on his country enrich these novels as much as Montalbano’s obvious pleasure in Sicilian cuisine: in The Potter’s Field (published in paperback in November) the detective breaks off from his investigation to tuck into a picnic including a whole tumazzo cheese and a flask of wine. Beginning with The Shape of Water, there are 14 Montalbano novels to be devoured. Follow that feast with Marco Vichi’s series set in 1960s Florence, featuring the reflective Inspector Bordelli, a former partisan and dedicated gourmand whose favourite pork chops recipe is printed at the back of the second novel, Death and the Olive Grove. Italian crime series by Michael Dibdin, Donna Leon and Gianrico Carofiglio are also worth investigating.